This easy cranberry almond granola recipe will convince you that homemade granola is the way to go! Plus, find out the best tricks to get chunky granola with large clusters. I’ve been meaning to share this large-cluster cranberry almond granola recipe with you forever, but I wanted to do one more recipe test, and I finally got around to it this past weekend. We have homemade granola basically all the time in our home, so I will often share a post or story on Instagram about it (this week, I’ve been loving granola + chocolate almond milk) and I always get asked for the recipe! Sorry it’s taken so long! Homemade granola is so easy to make, delicious, and it usually ends up being cheaper than store-bought. A few years ago, I tried making it for myself for the first time and I’ve never looked back. For breakfast, we love to eat granola on top of yogurt, smoothies, or with milk and most of all, we love eating it straight-up by the handful as a snack. It tends to just disappear bit by bit as we pass through the kitchen during the day. The best thing about homemade granola though, is that you get to customize it however you like when you make it yourself! And the main goal for me is always to get the largest clusters in my granola. 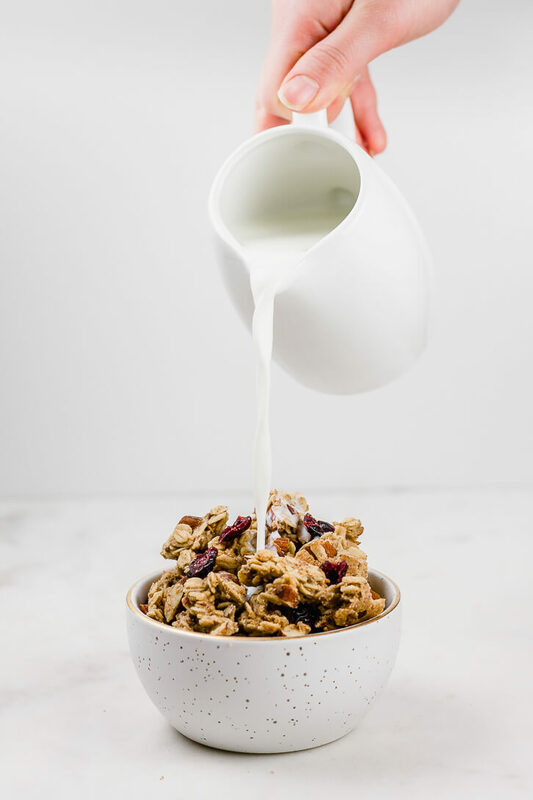 I like my granola pretty much as chunky as possible, and I’m hoping you do too because I’ve got some of the best tips to share with you today! The tips below are the three factors that I have found to be the most effective and consistent in yielding chunky granola with clusters that have both crunch and chew at the same time. I know, I know, it sounds totally paradoxical, but it’s a thing! In addition to whole oats, add oat flour (you can make your own by grinding oats in a food processor) to the dry ingredients. Once the wet ingredients are added, the oat flour will help form a paste, which will ensure all the ingredients clump together. Add a beaten egg white, which acts as a binding agent. Before baking, press the granola down firmly in the pan, so that it forms a single layer. The granola will actually bake into a large “bar” and can be broken into clusters of your desired size. Once you’ve got a handle on it, this cranberry almond granola recipe can be adapted as you like to fit your flavor preferences, or whatever ingredients you have on hand. Feel free to play around with different kinds of spices and add-ins: swap the almonds out for another type of nut, add a different kind of dried fruit (or chocolate chips!) after baking, etc. The sky is the limit! And if you need some inspiration on what to do with all your granola, you should definitely check out these blood orange and yogurt breakfast bowls because they are DREAMY. This easy, large-cluster cranberry almond granola recipe will convince you that homemade granola is the way to go! Plus, find out the best tricks to get chunky granola with large clusters. In a large bowl, combine together oats, oat flour, almonds, flaxseeds, cinnamon, nutmeg, and salt. In a medium-size bowl, whisk together maple syrup, egg white, vanilla extract, and coconut oil until well blended. Pour wet ingredients into dry and stir until completely incorporated. Pour granola onto prepared baking sheet and using your hands, firmly press the granola down into one even layer. Bake at 300 degrees for 37-40 minutes, rotating the pan halfway through. Remove the pan from the oven and set it on top of a wire cooling rack. Let the granola cool completely. Once cooled, break granola into clusters as desired and mix in the dried cranberries. Store in an airtight container at room temperature.